This gated Tucson community of The Westin La Paloma Resort and Spa area Arizona real estate offers a terrific variety for the upscale Tucson Arizona home buyer. The acreage is sited on both sides of Sunrise Boulevard between Swan Road and Campbell Avenue. La Paloma Estates Resort Community has 200 magnificent Tucson Arizona homes, all built since the early 1980's on acreage that once belonged to one of finest developers. The centerpieces of the foothills neighborhood is the very challenging Jack Nickolas 27-hole golf course, a private country club and fabulous world-class 5-star resort hotel operated by the Westin chain. La Paloma Estates Resort Community offers Tucson's finest Arizona golf, entry guards and Mountains right in your backyard. These Catalina Foothill views are quite open as the La Paloma Estates Resort Community uses natural low-growing trees and shrubs beside their streets. Prices for Arizona single-family homes in the La Paloma Estates Resort Community range from $500,000 to $5,000,000. You may also be able to get a small Arizona townhome inside the gates, and there are also an assortment of mid-range townhouses to $350,000. This La Paloma Estates Resort Community offers variety for people who want the lifestyle of a Arizona luxury gated community. 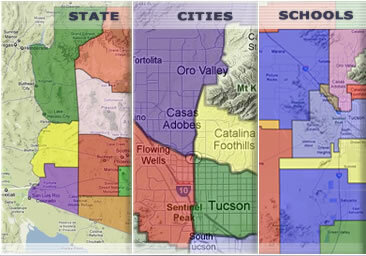 The schools are the most sought after Catalina foothills District 16. La Paloma Estates Resort Community residents live on a 27-hole Jack Nicolas golf course. 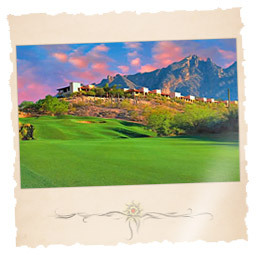 In addition to the golf course, this Arizona gated golf community offers a private country club and the 5-star La Paloma Resort & Hotel, featuring four restaurants, the world's longest waterslide, sparkling swimming pools, health clubs, aerobics, skin care services, and three therapeutic spas with great luxury treatments. The Arizona gated La Paloma Estates Resort Community offers a terrific variety for the upscale homebuyer. Students attend the highly sought after District 16. The Arizona acreage is sited on both sides of Sunrise Boulevard between Swan Road and Campbell Avenue. 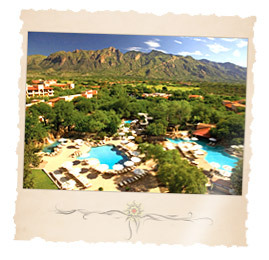 La Paloma Estates Resort Community is situated above Tucson in the foothills of the Santa Catalina mountains, is truly one of the finest areas of the southwest. A private La Paloma Estates Resort Arizona Community in the middle of the 800-acre La Paloma community, the magnificent high desert surrounding and stunning mountain and city views complement the superb community atmosphere. The tools to begin your new La Paloma Estates Resort Community Arizona homes search are right at your fingertips! To get started, simply click on the quick link above or browse new Arizona construction homes and houses for sale using the links to the right. Find a new La Paloma Estates Resort Community Arizona home for sale or locate a home builder in Arizona on MyOwnArizona.com. Our MyOwnArizona™ La Paloma Estates Resort Community real estate guide showcases new construction homes, townhomes, condos and new Arizona communities by new home builders throughout the State of Arizona. Find new homes by map, desired home price or by browsing new developments and floor plans by lifestyle or home type. All Arizona home listings include home price, location and money saving incentive offers to make buying a new La Paloma Estates Resort Community home more affordable. All houses for sale listed include floor plans, pictures and many offer tours of the Arizona new homes and communities. Contact us at: info@MyOwnArizona.com for Arizona & La Paloma Estates Resort Community in Tucson, AZ real estate.